Of the many stunning architectural and artistic achievements that have come down to us from the Islamic world, one of the most incredible is the art of calligraphy. Forbidden from illustrating holy texts with images of human figures (images that are common in many Christian religious books), the Islamic world transformed writing itself into an art form. A great many examples have survived to the present day. Additionally, because of the beauty and centrality of calligraphy to Islam, there has been a great deal of scholarship written on the subject and spectacular Qur’ans are proudly displayed in some of the world’s most famous museums. That said, given the quantity of Qur’an manuscripts which have been passed on to us, much of what has survived is not as well studied and documented. 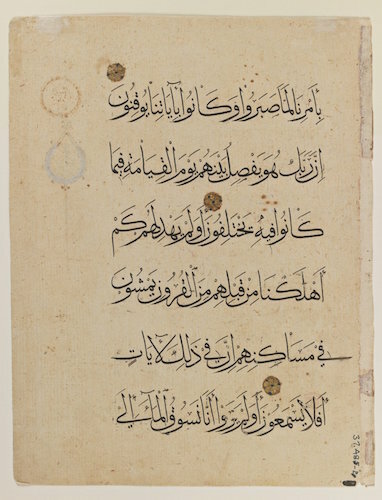 One such example is a double folio (two pages) from a Mamluk Qur’an, currently housed in the Brooklyn Museum of Art (the Mamluks ruled over key areas of the Middle East, including Mecca and Medina between 1250 and 1517). The double folio was likely produced sometime during the 14th century in either Egypt or Syria and contains the end of sura (chapter) 32 of the Qur’an known as as-Sajdah (the prostration) and the beginning of sura 33, al-‘Ahzab (The Combined Forces). There are many distinct styles of calligraphy, known as scripts, and this particular Qur’an is written in a script known as nashki, which was one of the most popular of the Mamluk period. As an illustration of the abilities of Mamluk calligraphers, it is excellent. It is not the quality of the calligraphy that differentiates this double folio from its better-known peers, but rather the quality of the decoration. Take, for instance, the most famous Mamluk Qur’an, that of the high official (and later sultan) Baybars al-Jahangir. This Qur’an, produced between the years 1304 and 1306, exemplifies the extraordinary level of ornament that grace the pages of many Mamluk Qur’ans. The borders of the page are wonderfully detailed with the vegetal patterns known as arabesques which completely enclose the calligraphy. The ends of each aya (verse) are marked by small, exquisite golden rosettes and the outside edge of each page contains meticulously detailed medallions, and even within the text box, regularly spaced dots in gold ink fill the blank spaces between the calligraphy. In comparison with the Qur’an of Baybars, the Brooklyn Museum’s double folio is virtually devoid of decoration. A single small medallion, vertically placed, marks the outer edge of each page, and rosettes, which are no match for the virtuosity of the rosettes from the Baybars Qur’an, represent the extent of the decoration. Furthermore, the double folio is written in dark blue or black ink with sura headings written in gold. By contrast, the entirety of the Baybars Qur’an is written in gold ink, except for the sura headings which are written in a brilliant red ink. Not surprisingly, the Baybar’s Qur’an garners far more attention and study than does the Brooklyn Museum’s double folio. However, in many ways, this obscure double folio is more interesting than the famous Baybars Qur’an. We know a great deal about the history of the Baybars Qur’an. We know when it was written and that it was intended as a waqf (charitable endowment) for his khanqa (a form of monastery or prayer house for Sufis). By way of contrast, we know virtually nothing about the Qur’an from which the Brooklyn Museum’s double folio came, and that is a large part of why it is so fascinating. The double folio has an unusual feature. It is written with six lines per page. Generally speaking, Qur’ans throughout the Islamic world are written in odd-numbers of lines per page. We do know, that there is a Syrian tradition of producing Qur’ans with six lines per page. 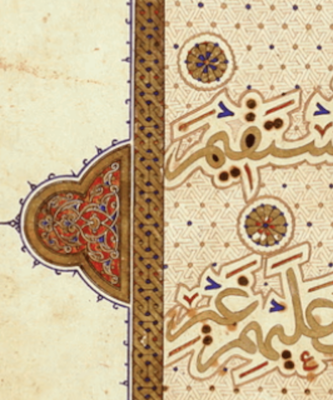 It is possible that the calligrapher, or the patron was Syrian. There is another possibility. 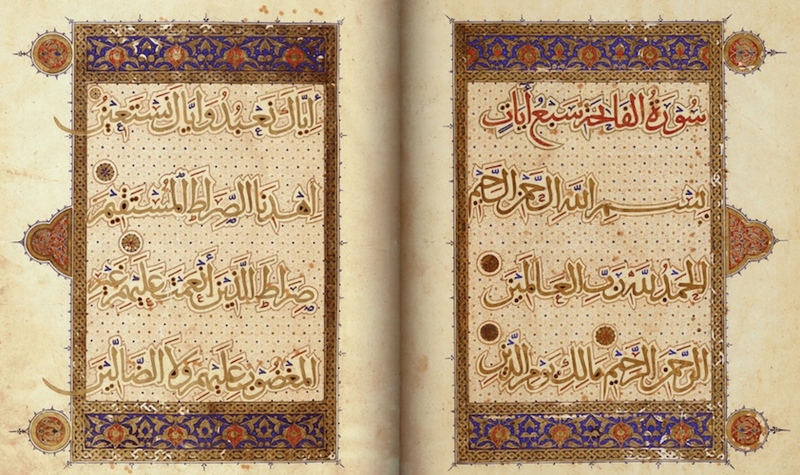 The Baybars Qur’an was also written with six lines per page. Perhaps the patron of the Qur’an had seen the Baybars Qur’an and wished to emulate it. We cannot know for certain, and there are enormous range of possibilities to explore. From the perspective of studying the double folio and others like it (there is a very similar folio in the Freer and Sackler Galleries of the Smithsonian) they hold one additional advantage over the Baybars Qur’an and its ilk. These Qur’ans were almost certainly meant to be used as everyday items. The Baybars Qur’an was, at its core, intended not as a practical object, but rather as a public demonstration of power, wealth and piety. On the other hand, the Qur’an of the double folio could have been commissioned as someone’s personal Qur’an or for their child to use as a student at a madrasa (school), or it may have been intended as a gift. Regardless, it was probably something that real people in the 14th century interacted with on a daily basis, not only on formal occasions and that, when combined with the beautiful calligraphy is what makes such objects truly special. Sheila Blair, Islamic Calligraphy (Edinburgh University Press: Edinburgh, 2006). David James, Qur’ans of the Mamluks (Thames and Hudson Press: New York, 1988). Martin Lings, The Quranic Art of Calligraphy Illumination (Interlink Publishing: New York, 1976). Jonathan Bloom and Sheila Blair, The Grove Encyclopedia of Islamic Art and Architecture vol. 1 “Calligraphy” (Oxford University Press: New York, 2009). Annemarie Schimmel, Calligraphy and Islamic Culture (New York University Press: New York, 1984). Cite this page as: Mark Guranaccia, "Mamluk Qur’an," in Smarthistory, August 8, 2015, accessed April 23, 2019, https://smarthistory.org/mamluk-quran/.